To discover more about Mike and his 12 Tone Music Publishing company, please visit: <www.12tonemusic.com>. And don’t forget to join the official Mike Overly/12 Tone Music Mailing List… and please forward this link to a friend! The Guitar Clef ® is a registered trademark of 12 Tone Music Publishing, LLC and it is more than just a clever logo design, it is symbolic of the way guitar music is notated. Here’s what I mean. Guitar is a transposing instrument. It sounds one octave lower than it is written in staff notation. In other words, staff music for guitar is written in the Treble Clef, however, the majority of the guitar sounds in the Bass Clef. Let’s begin with the first staff note shown in every book 1 guitar method: string 1, fret zero/open, E.
Now, this doesn’t pose a problem unless you’re playing with another treble clef instrument for example, the piano. This is because when the guitar and the piano read and play the same staff note, two different sounds are heard. Remember, the guitar sounds one octave lower than the staff note that is written. This is why guitar staff notation should have an 8 beneath the treble clef. This tell the player to play the staff note one octave lower than written. However, you won’t see it used in guitar method books. Here’s another common book 1 example: string 2, fret 1, C. Notice that this example uses ledger lines. Ledger lines enable pitches to be written that extend lower, and higher, than the 5 lines of the staff. It should be noted that this is the first staff note presented in the Tone Note™ Music Method for Guitar Book 2. When the treble clef begins to use ledger lines below the staff, the bass clef becomes useful. This next example shows how guitar notation writes a treble clef C, how it actually sounds in the treble clef, and how the actual sound is written in the bass clef. Book 1 guitar methods only teach three open position treble clef staff notes on string 2, B C D. The following example shows how guitar notation writes B C D in the treble clef, how it actually sounds in the treble clef, and how the actual sounds are written in the bass clef. This next example illustrates the complete range of open position treble clef staff notes that are presented in every book 1 guitar method. Pitch letters and circled string numbers have been added. Now, you can clearly see that the majority of the guitar’s pitches actually sound in the bass clef. There is only one book that I know of that presents the actual pitches of the guitar in true staff notation: the Johnny Smith Approach to Guitar, published in 1971 by Mel Bay MB93669. 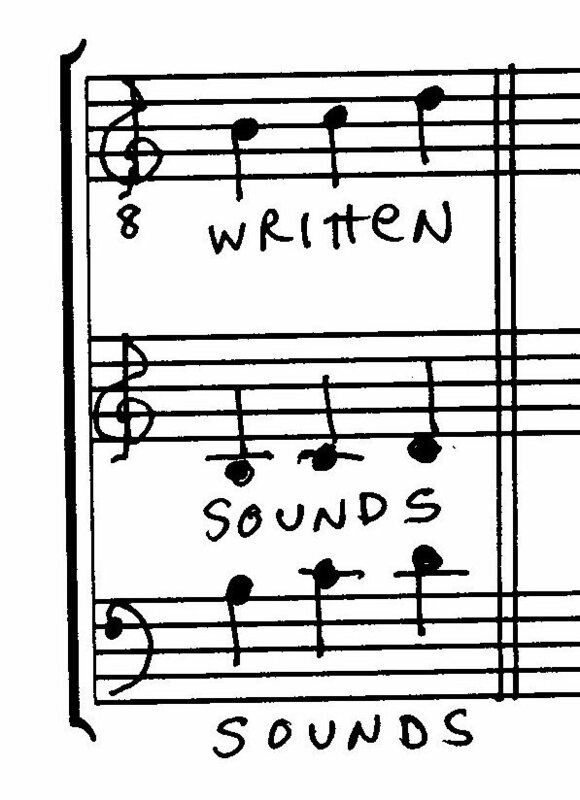 Here is a Schoenberg example Johnny included in his book to illustrate that others have acknowledged and used this actual pitch guitar staff notation. In Johnny’s book, he writes guitar music using two braced treble and bass staves that look like like piano staff music. Here is what a C major chord looks like in actual pitch treble and bass staff notation. Again, you can again easily see that the vast majority of the guitar actually sounds in the bass clef. And this is why the Guitar Clef ® is not only clever and trademarked ~ it’s true! 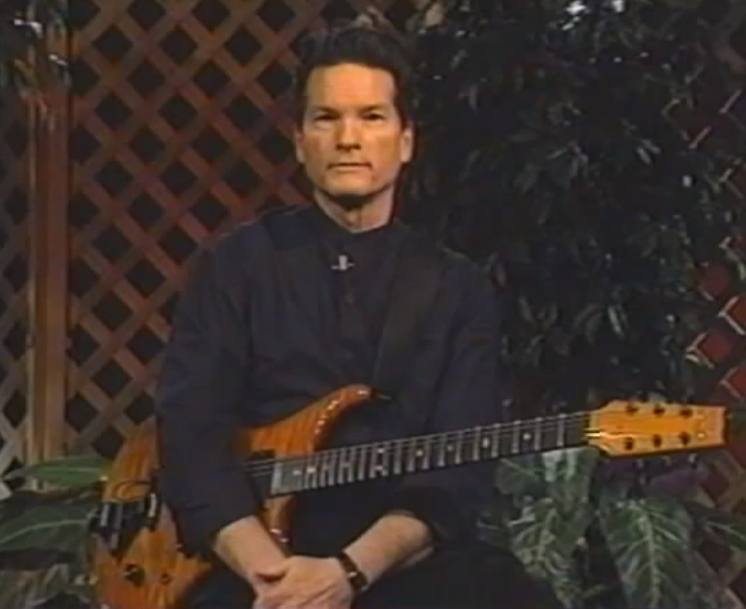 ’til next time, have some guitar playing fun no matter what clef you use… I’ll be listening! You are currently browsing the 12tonemusic blog archives for February, 2015.